“On a beautiful blue-sky day, our full group of eight made the steep climb up to the lake, where we enjoyed a well-earned lunch break before heading over to admire the glacier. A decade since my first visit to the lake, and of all the hikes in my decade series, this one has perhaps shown the most obvious change. The glacier has receded over 100 metres in that time, with this last summer being especially devastating. It has to be seen to be believed. And yet it is still perhaps the most accessible glacier in the Lower Mainland, and still a ridiculously photogenic place. In case you hadn’t heard, there’s a new trailhead and parking lot, at the end of a new road that is signposted from the old parking lot. Be aware that there is active construction going on there too. The lower section of the trail is also new, and I have to say much improved over the old. After about a km the new and old trails merge and the hard work begins. The mud was negligible, and only one fallen tree to negotiate. A mere 3 hours of steady hiking saw us at the lake (only two and a half hours back to the car) leaving us nearly 3 hours to enjoy being up there. “Finding ourselves with more sunshine than forecasted, we upgraded our destination and headed to Wedgemount Lake for this glorious weekend. The snow was vastly more abundant and better than last winter; there was hardly any no iciness. A congenial group of seven with varying levels of experience, we snowshoed the entire way with only minimal slipperiness. Routefinding did not pose any problems on this trip. We reprised last spring’s approach and headed up a ridge beneath Mount Cook – descending back down onto Wedgemount Lake – and bypassed the steep and avy-looking summer route. Once at the lake, we witnessed a few cornice-triggered avalanches. Calum videoed one and it is posted on the Wanderung Flickr site. “A hike that adds up to more than the sums of its parts does not happen very often. In our case today the personalities gelled; selflessness and team work abounded; and a young novice hiker transcended her relative inexperience and triumped over 1,600 m of cumulative elevation gains using crampons, snowshoes, and poles in trying conditions – all for the first time! 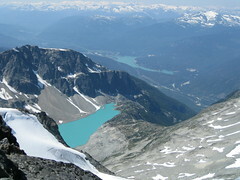 Weather conditions were ideal – perfect, actually – with a high of 12 C at sun-drenched alpine and windless. Seven of us: Bala, Ben, Biggi, Blair, Dan, Irina, and Scott headed up early and found ourselves at the lake just past 2 pm. With the hot sun burning our bare skin, one tube of sun screen was found and generously shared amongst all of us.